Things I like about Sydney No. 24: The Second Deluge. Last week it rained. And rained. And rained and rained and rained and rained. And then rained some more. In all honesty, this shouldn't be a subject for this blog because I really, really didn't like it. It meant, for instance, that Sniff refused to step outside the house and lay, bored stiff, in front of the gas fire looking at me dolefully as if it was my fault that it was raining. He had to be forcibly carried out to the back of the house (where by this point there was a tsunami raging down the path towards the creek) to ensure he didn't pee up the chaise longue (which he did anyway) or poo on the carpet (which he did later, but that's another story). 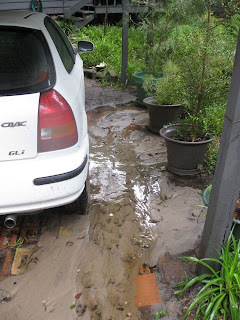 It meant that half of the driveway washed itself down towards our parked car, leaving great canyons and piles of bricks to navigate further up the drive and great puddles of sand and silt to walk through to get to the front door. It meant that our towels were constantly damp and that no washing would dry. It meant that I had to wear Daniel's unsightly wellington boots - in public. 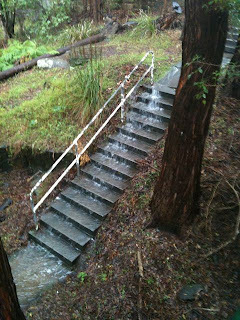 It meant that, even when the rain ceased for a moment, you couldn't go walking along the creek as normal because the path was flooded. 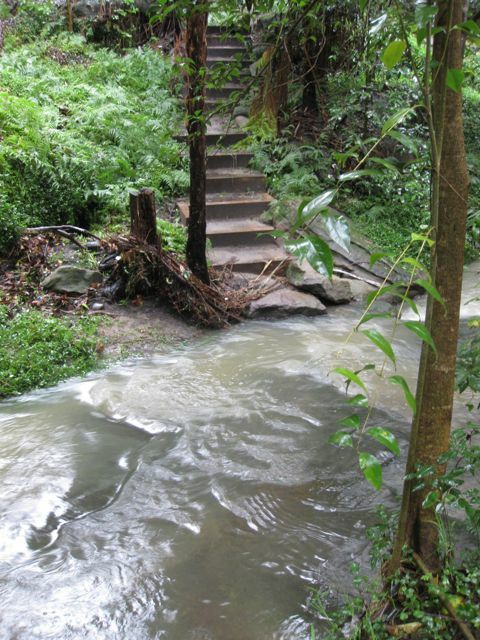 (Here's where we have to cross the creek over what are normally dry boulders). 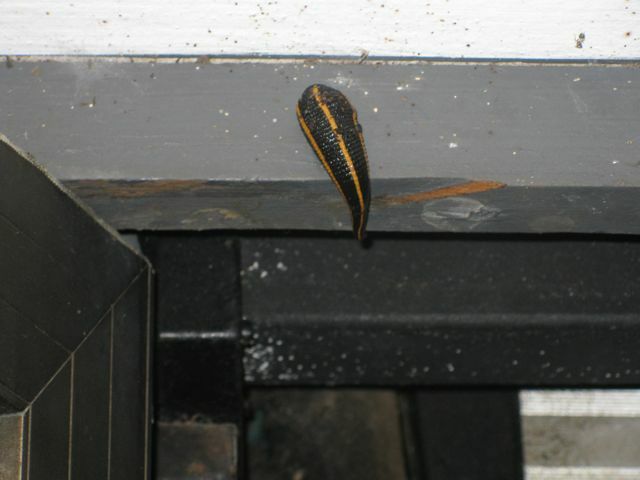 And worst of all, it meant that the leeches came back in force. One even suckered itself to the lintel of the door hoping to latch on to our ears or cunningly kamikaze drop down the back of our shirt collars. It was a particularly choice, fat and dapper specimen - stripes indeed! Is it trying to endear itself to us with this flamboyance? However, I feel that I can, Noah-like, appreciate this deluge to some degree and it can therefore become the 24th subject for this blog of "Things I like about Sydney". 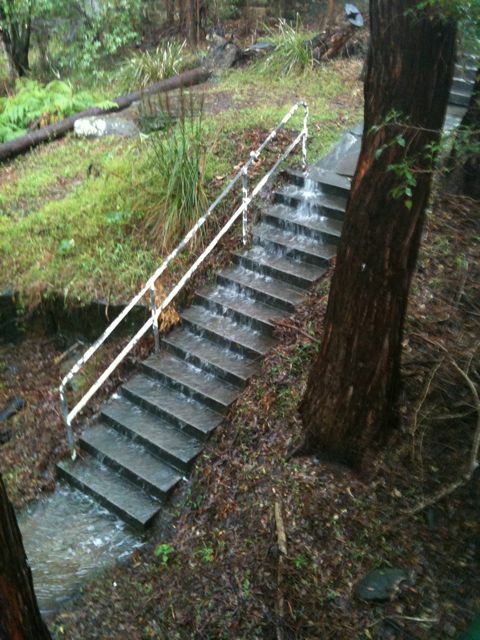 After all, the rain here is so extraordinary. As unlike London rain as it is possible to get. Its persistence and endurance give Paula Radcliffe more than a run for her money. It is so loud, the drops so large. Teeming. That's the word. It teemed. One day in particular was biblical. Friday, 4th June. One week ago now. The rain was constant for fourteen hours, a constant teeming. Just when you thought it could not get any heavier or any louder the tempo and the volume would crescendo, the sky get even darker, and the water fall in blinding, thicker sheets. Trees fell down across the creek. Waterspouts appeared in Sydney Harbour and, rather frighteningly, waterspouts become tornadoes when they hit land, which they did in the Eastern Suburbs - Bronte and Marouba - causing some damage. The Sydney Morning Herald reported that on that day "in the eight hours to 5pm, Sydney recorded 63mm of rainfall, with heavier falls in the city's northwest" ie., for us. 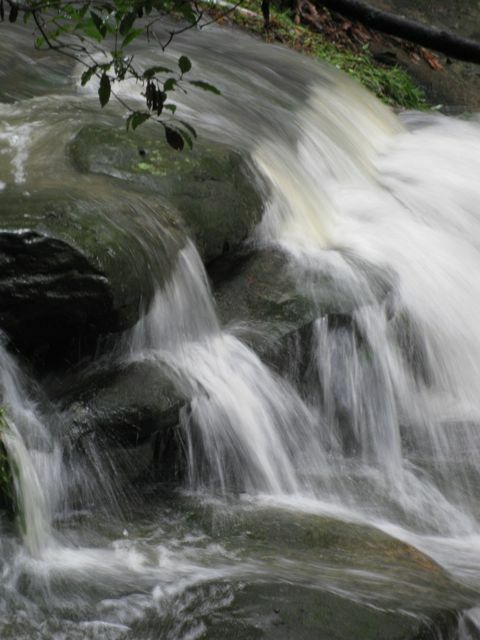 The creek became a magnificent, raging, noisy torrent. We can normally hear it from the house, benignly tinkling away; now it roared rather frighteningly. 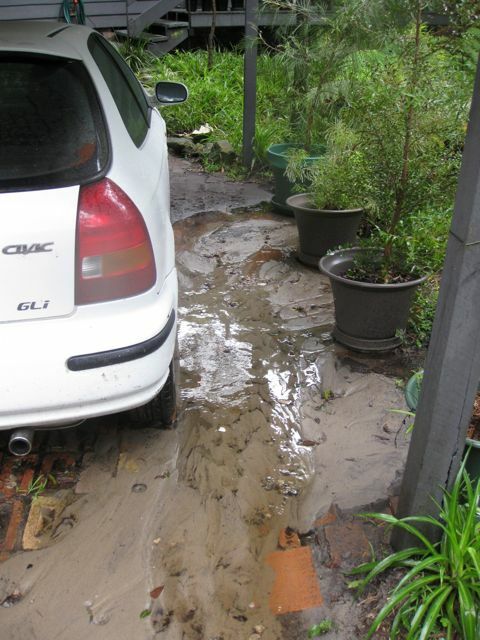 I cowered inside all day waiting for the tornado to hit Greenwich, periodically shaking out Daniel's wellington boots to ensure that there were no leeches inside, donning them, grabbing Sniff, and running out through the silt and the puddles to plonk him in the drive to pee. I felt as if I lived in an ark but had failed miserably to gather together any beasts more savoury than leeches. Even Thang and Kev the lorikeets were nowhere to be seen and Sniff didn't count as a solitary canine. Eventually it stopped raining. We didn't float away after all. The leeches have disappeared, the creek can once more be crossed and the tsunami at the back of the house has dried to a trickle. And I'm about to take Sniff out for a proper walk. Catch you later. Mrs C says have you not found a recipe for leech soup?